Note: Due to damage to the canal the 2019 course has been modified to exclude the portion between Brunswick AS and Nolands Ferry AS. Please see the revised 2019 course description here. Below is the official course map with the entire course outlined. As mentioned in the general description, note that the first loop uses an extended northbound section (to the North Turnaround) to make up extra distance (60 mile loop). On the second loop the north turnaround is the Dargan Bend AS (40 mile loop). The aid stations marked, and mile distances between aid stations indicated. You can find distances between aid stations here. A written description of the course may be found here. The section of the course near the start/halfway/finish has been effective from the 2014 event as part of a small change to the overall course. The satellite map below illustrates these changes. The below files are accurate for the 2018 race. 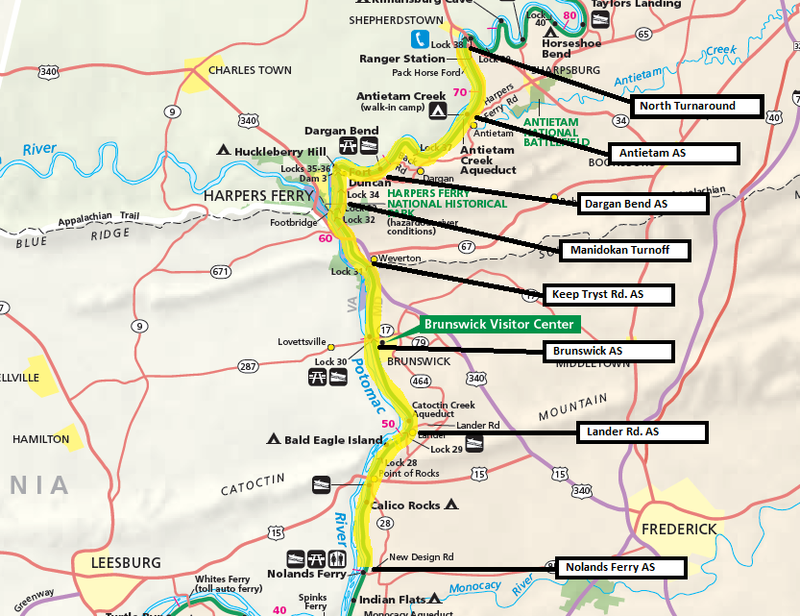 Below is the official National Park Service map of the entire C&O Canal.